Summer in the DMV (District/Maryland/Virginia) demands short pants. Unfortunately, those who can’t/won’t/don’t pay attention to the style changes in short pants are doomed to repeat themselves, year after year, ad nauseam. Clarendon #brosteez demands brown flippy-floppies accompanying the shapeless, flapping man-skirts known as cargo shorts. Granted, some of them do pay attention to the outside world. And while some of those choices are quite fashionable (although that salmon color is done), none of them are fit for riding a bike. What does one do if they live the #bikelife and need a proper commuter or messenger short that works like spandex but ain’t? 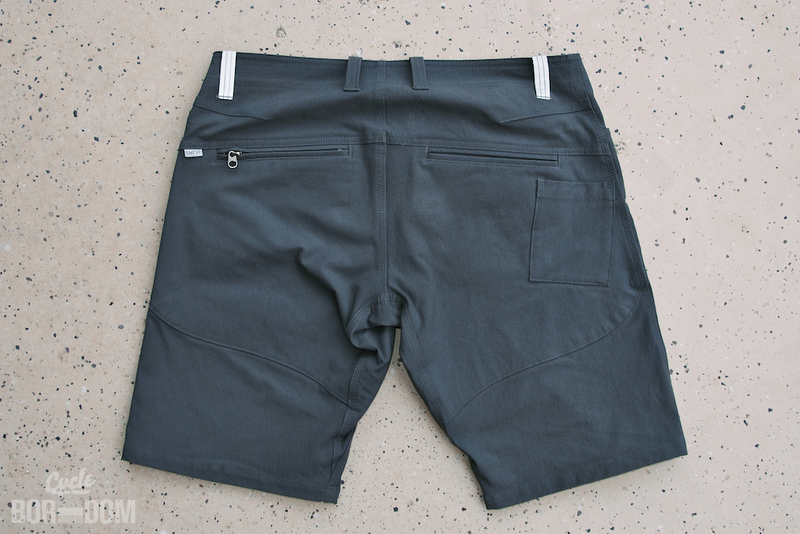 Enter swrve’s Durable Cotton Cigarette Shorts ($75USD) Could these be the ultimate commuter shorts—both #bikelife and #messlife approved? I’ve been riding them for several months. This is what I’ve found. This is the same fabric that I’ve been riding in their Slim Fit Trousers. It looks, feels, and sounds almost like canvas, but it’s nowhere as unforgiving as what I used to paint on when I used to paint. And re: the feel, it initially seems to share the tactile traits of canvas but that’s where it ends. More on that below. Obviously, these are chock full of useful bike friendly goodness, because swrve. The standard array of pockets, slots, reflective bits, and my favorite: the seamless crotch, are in attendance. Like most of the products swrve sends me to test, I wear them more than is hygienically sound. That’s a testament to how much I like their products. Either that or I don’t do my laundry often enough. My hamper looks an awful lot like a biohazard material box, so that should tell you something. Questionable cleanliness aside, these shorts rule. 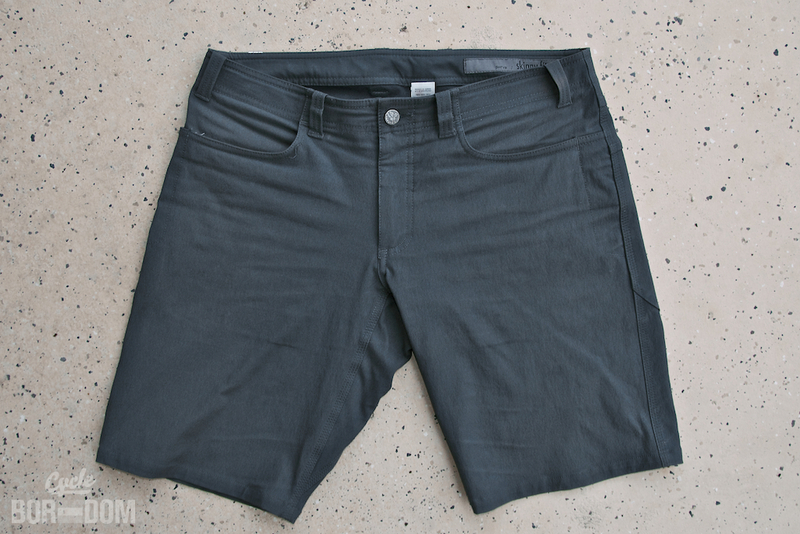 They’ve been serving as commuter shorts, distance riding, and work/life shorts. Seriously, I wear these and the black pair *a lot*. The durable cotton shows nearly now wear. It feels as though it should be rougher than it is. When you pick them up, they feel hefty and substantial. Not heavy, just abuse-ready. When you pull them on, the lightbulb goes off. They feel much lighter and more unobtrusive than you expect. The 4-way stretch accommodates everything thrown its way. And it does so in a way that doesn’t seem forced. They simply stretch to let you fit inside. 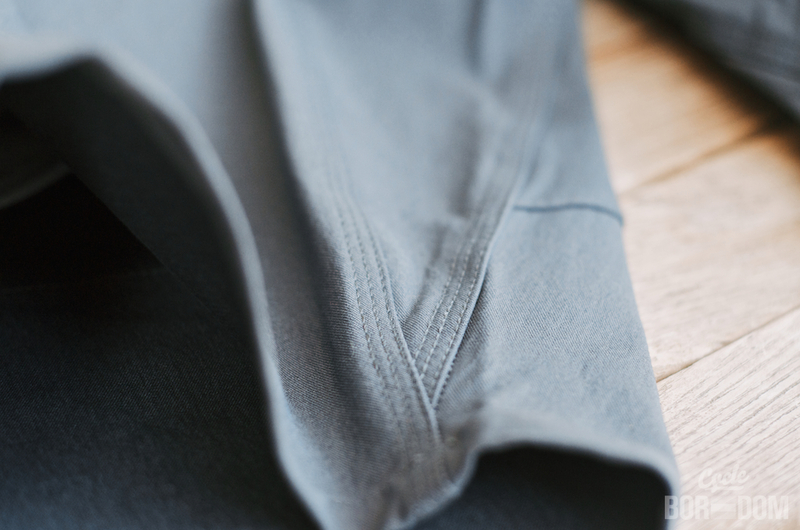 The slim fit almost acts as compression, but does so without constricting. Not their intent, but at this width it’s inevitable. 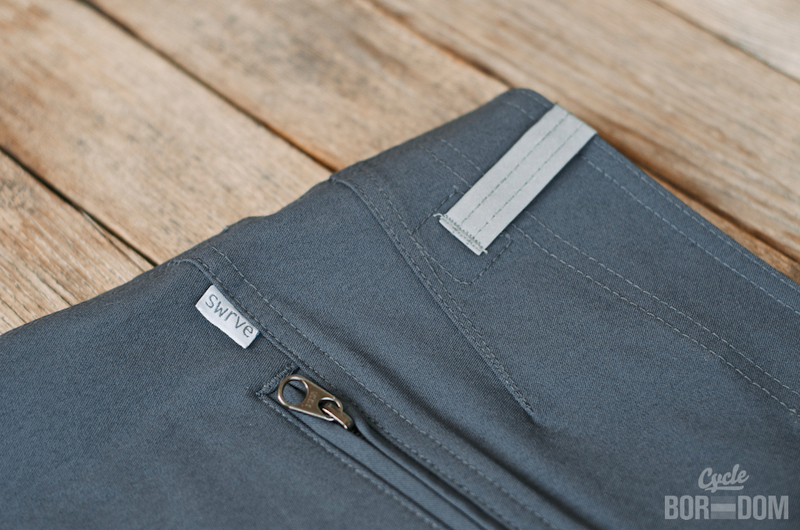 The seamless crotch makes sure they don’t inhibit your pedaling regardless of what bike you’re on (road, track, porteur, cargo). I suppose it’s worth noting they seem to dry quickly as well. Guess that’s expected of most cycling garments, so not earth shattering. This will be easy. They are toight. I wanted them that way. Not all of you out there are into the toightness, and for this I forgive you. You must realize from whence I came. When it was common for skaters to wear giant oversized clothes even the homeless would pass on, I did so with gusto. Now, completely repelled by those days and by those who still think rave wear from the 90s and early 00s is acceptable, I’ve adopted the skinny fit steez of my hipster brethern. When I don these shorts whilst astride my steed, I look as though I’m wearing thick spandex. Which, essentially, I am. The 4-way stretch works well. So well, in fact, you can read the text on my iPhone through my pants, because embossed. As I slowly pour my Andre Greipel-esque legs through the articulated knees and trim leg opening thinking there’s no possible way these 34s can accommodate my 35ish waist, it happens—I’m buttoning them. Needless to say, the shorts, despite their toighnicity, stay out of your way when pedaling. Although, do not place your keys in you pockets as they will become embedded in you thighs, because toightness. That being said, they’re not jeggings tight. I’d never be *that* egregious. Honestly, there are none. You could say they are too tight, but they’re supposed to be. If you need a different fit and length, those models available for purchase. 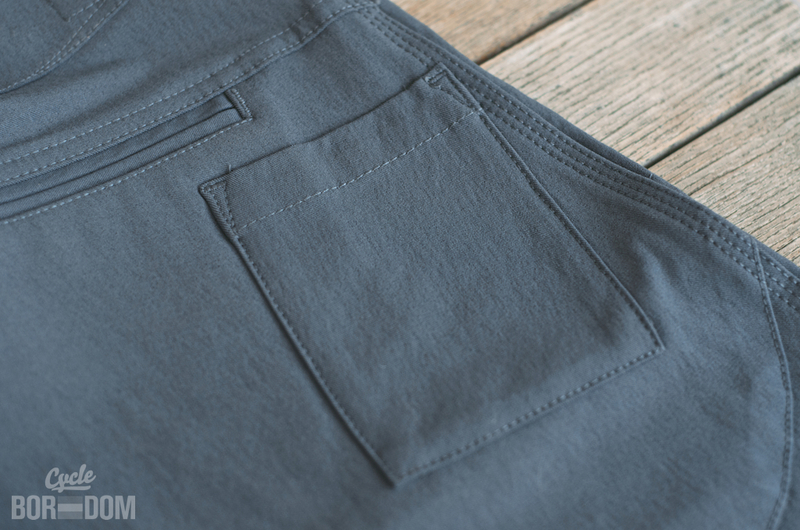 If you felt they were too heavy (they’re not), then try the lighter WWR Trousers. My only complaint is that I need to lose more of my spare tire so I can fit into a 34 waist w/out having to pour myself into them. Also, one or two stitches underneath the button (picture towards the top) are ever so slightly askew. Shame on you, swrve. The fabric stretches well, it stays out of your way while riding, and it (so far) hardly shows any wear. I can't ask anything else from 'em. 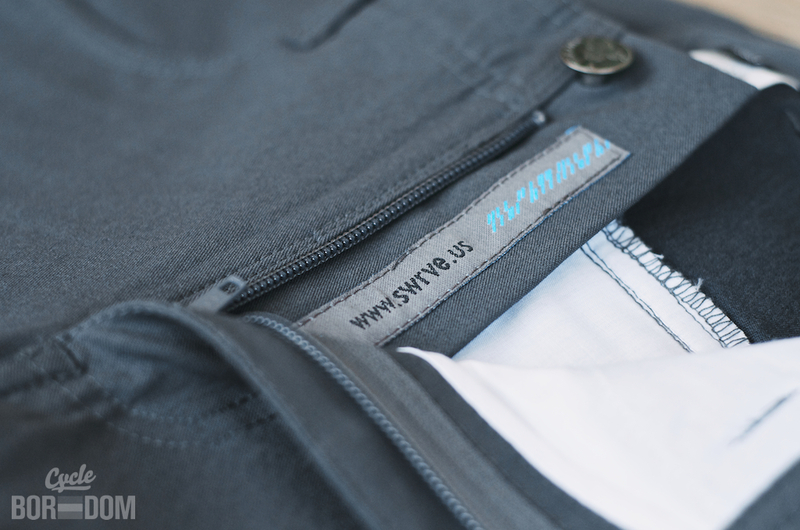 If you're looking for a short capable of handling daily messenger work or commuting while looking great off-bike, then you can't go wrong with the swrve Durable Cotton Cigarette Shorts. File under: damn goed short pants.